"Plumbing accidents may occur at odd hours. Plumbers usually work from Monday to Friday between 9 AM to 5 PM. What if there is an emergency after working hours or late at the night? Such issues would potentially cause a lot of damage depending upon their nature. It can’t wait for morning either. That is when the role of an emergency plumber comes into play." An emergency plumber is the one who turns up to resolve an emergency plumbing situation or plumbing accident, no matter what time of the day is. They are usually a call away and help you with a variety of plumbing issues. Round the Clock Support (24x7)- Depending upon the plumber, a company provides 24-hour, 7-days a week service to the customers, and their reliability cannot be challenged. When you have a severe plumbing problem such as a blocked toilet, burst pipe or any other plumbing emergency that cannot wait till morning, you can give them a call even in the midnight. Very Prompt- As these services are named as ‘emergency’, the plumbers are generally fast and arrive at your home or business to quickly resolve the issues. You do not have to wait too long to get a plumbing damage fixed. Well-equipped- Another benefit of the emergency plumbers is that they are equipped with all the necessary tools to handle any kind of problems. They are generally prepared to deal with all type of situations and fix the issues at any time. Economical- Though emergency plumbers may charge more than the other plumbers, this will help you save the extra bucks which would be spent in fixing other damages if the plumbing accident persists for a long time. Security- Reputable companies perform a thorough background check before licensing a plumber. This ensures that there is no security breach, and your property and you are safe. Though emergency plumbers will be available whenever you need them, it is best to get your plumbing system checked regularly by plumbing experts as an act of ‘prevention measure’. It ensures proper functioning of the plumbing system and there will be no potential threats in the future. For this, you can sign a contract with a well-known plumbing services provider and use avail their services long term. 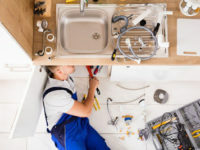 There are many plumbing service providers in Brooklyn, NY, to help you with a seasoned Emergency Plumber in Brooklyn, NY at an affordable price. This would reduce the costs even more. C James Plumbing is here to help you resolve any issues. Click here to contact us today! My mom approached me last night and mentioned something about the toilets backing up and the sink drains being blocked. I thought nothing of it and just continued doing my work until I experienced the same problem this morning. It was horrible, so I decided that it might be a good idea to call a plumber. Like you said, hiring professional plumbers is a better idea because they are equipped with the best and necessary tools for the job. Thanks for sharing the info!